Pure & clean air should be a basic necessity anywhere we live or work. But that was not always possible until now. Use your air purifier to eliminate smoke, odor, dust, mold, allergens, pet odors and even help reduce mold, mildew, allergy symptoms more than any other indoor air purifier on the market. Ionic and using UV light to beak down pollutants, these units which, have clinically been proven to remove cigar and cigarette smoke create a zone of clean and pure air in limos, trucks, boats, restrooms, farms, factories, hotels, restaurants, kitchens, offices, homes, and even in agencies of our Federal Government. Designed for meeting rooms or spaces up to 2000 sq. ft. Biozone air purifiers are the ultimate in clean air purification. They clean the air of cigarette & cigar smoke and biological contaminants like bacteria, viruses, and mold, destroy hazardous fumes, remove harmful particulates, and neutralizes all unpleasant odors. Keep your clothes and belongings from smelling like cigarette smoke. Backed by a 1 year warranty and money back guarantee. Size: 10" X 10.5" X 4"
Power Source: 12-V DC with accompanying adapter. Low-maintenance Unit: no filter to change, replace lamp once a year when required. Output Control : 3-position output control for adjusting to pollutant levels and available space. Purifying Method: photoplasma, UV, ions, and ozone Biozone Technology. Learn more about Biozone Technology and how it can be a solutions to indoor air quality problems below. 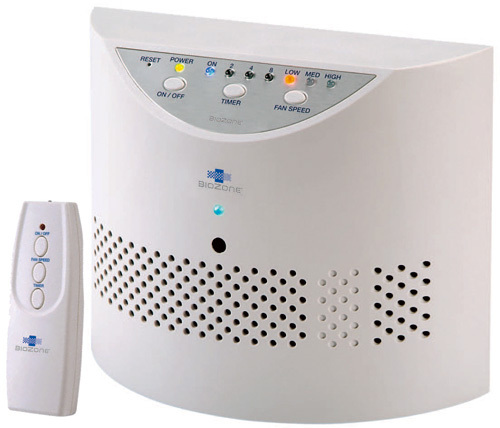 The Biozone PR20 Meeting Room Air Purifier is designed for spaces up to 2,000 square feet. This air purifier is ideal for meeting rooms, apartments, small homes and offices up to 2,000 square feet. 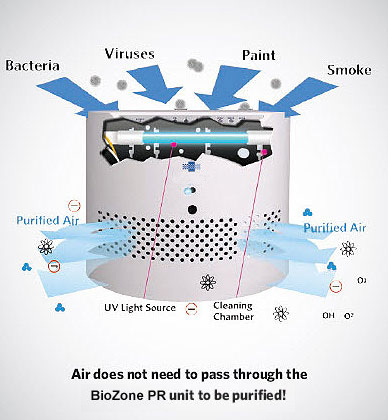 Biozone air purifiers are unlike any other air purifier available. They are literal air cleaners that rid the indoor air of biological contaminants like smoke, secondhand smoke, bacteria, viruses, mold and mildew, hazardous fumes, and also neutralize the air of all unpleasant odors. Biozone air purifiers are the ultimate in clean air purification and are backed by an extensive 3 year warranty and a money back guarantee. There are five ways of air purification which makes them the best indoor air purifiers on the market today. Biozone Scientific�s PureWave� & UltraPure� technology creates a true smoke eater clinically proven to remove more cigar and cigarette smoke odor. They are proven to eliminate harmful mold, bacteria, viruses, germs, smoke and pet odors more than any other indoor air purifier on the market. This is a gas that is fully ionized by UV-light containing ions and free electrons. The plasma that is created or electrically charged particles of the plasma (electrons) seek out and destroy many different types of molecules. The lamps that Biozone uses have a specially formulated glass that pass through the deep UV light wavelength of 185nm. This generates efficient germicidal light for sterilization purposes and breaks down the electron bonds. These are electrically charged particles which have gained or lost electrons. 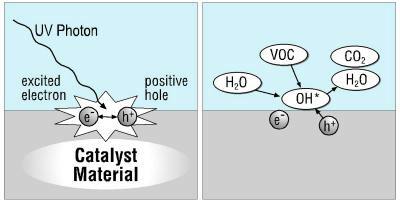 Negatively charged ions have excess amounts of electrons giving them a negative charge. Biozone's devices are creating these negative ions and they float around in the air interacting with chemical compounds and micro-organisms. They attach themselves to the airborne contaminants in the room and destroy them. Along with Ozone they contribute to Hydroxyl radical formation which is one of the most effective antiseptic species. Ozone is a gaseous compound that is normally found in the atmosphere. It is being produced by the reaction between Oxygen and UV-light. It is formed of three oxygen atoms. It is a bi-product of this whole process and the amounts generated are managed through the use of custom-designed, dual-purpose UV lamps, therefore blocking part of the UVC spectrum that contributes to a higher production of Ozone. Ozone's properties as a bactericide, viricide, fungicide, and deodorizer are well accepted by the scientific community. It can effectively and efficiently be used for killing harmful micro-organisms and destroying harmful substances such as VOC's. Odors such as smoke (from fires, cigarettes, cigars) pets, gym clothes, kitchens, bathrooms, mold, and musty basements, etc. Once the air has been cleaned by the Biozone you might notice a clean smell in the room. This means the Biozone has done its job. For this reason, make sure you don't get a unit that covers a lot larger area than what you have in any given room. The smell can become overwhelming if the unit is too large for the area. You should select your Biozone air purifier based on the pollution level, square footage, and ceiling height of each area you want the air cleaner in. If your floor plan has a lot of walls and doors you will probably need a purifier in each room or on each floor. On the other hand, if you have an open floor plan you could get by with one larger unit. Or you could decide to purchase an induct unit which will evenly distribute the output into each individual room through your home's HVAC system. The following guide will help you in deciding what size of purifier is right for you. Our standard ratings assume rooms with average to light odor and contamination. If the condition of that room is affected by other contaminants we have developed a set of rules that incorporate the use of a contaminate multiplier factor to better estimate the size of the purifier required. 1 Light Odor, No pets, No Smokers, etc. 2 Light Odors, 1 Pet or 1 Smoker, or Multi-occupant area, etc. 3 Moderate Odors, 2 Pets or Mild Smoking, etc. 4 Moderate Odors, Multiple Pets and Smoking house or business, etc. 5 Strong Odors, Moderate VOC's, Multiple Smokers and/or ongoing contamination problems. Restaurants, Hair Salons, Pet Stores, Veterinarian Offices, etc. 6 to 10 Extreme Odors, heavy VOC's, Bars with heavy smoke, Nail Salons, Commercial Chemical or Animal Areas, etc. Given a 1,500 to 2,000 sq. ft. of area in a single-level home with one indoor smoker. Multiply the 1,500-2,000 by the contaminate factor of 2 to get 3,000 to 4,000 sq. ft. Depending on the layout of the house (consider the larger open spaces and overall air flow, the number of rooms) you can purchase two stand alone models of a 1000 and a 2000 unit (4,000 sq. ft. total). Given a 500 sq. ft. of area in a single-level home with occasional smoking and a couple of pets. Multiply the 500 by the contaminate factor of 3 to get 1,500 sq. ft. A 1000 model with a 500 model could be purchased, or one 2000 model for the entire room. Can not be shipped to California.